As I've mentioned in previous posts, there is a long history of healing in the Adirondacks. From the current research underway at our hidden jewel, the Trudeau Institute in Saranac Lake, to the tuberculous work of Dr. Livingston Trudeau way back in 1884, to the very real, but abstract, wellness-inducing effect of living in a natural environment. This is a huge element of the Adirondack Lifestyle. Today's photo is a shot of one of the early 'cure cottages' in Saranac Lake from the days when folks with TB came to the Adirondacks to 'take the cure.' An important, no essential, element of the cure was to breath the fresh, unpolluted Adirondack mountain air. 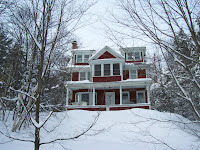 The porches were completed unheated and open, even through the bitterly cold Adirondack winters. The very ill who were unable to walk were brought out to the porches on the 'cure beds,' where they were bundled up in blankets, but still able to breathe the fresh and healing Adirondack air. It all sounds hokey except for the fact that it worked. And still does to this day. I take the cure every day, and am, no doubt, healthier for it. Today's cure, by the way, involves skiing fresh backcountry powder and Mt. Marcy. The Adirondack Lifestyle is all about quality of life! Yes, I promise to post pics of today's ski, especially for the special request! !